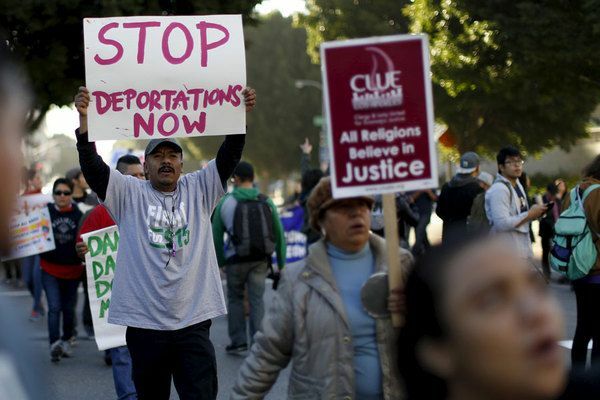 If Donald Trump aims to significantly reduce the presence of undocumented and unlawful immigrants in California, he will face staunch opposition. From the municipal to statewide level, officials have come out strongly against the prospect of stronger enforcement and deportation. Excoriating Kobach for a “pattern of supporting racist, anti-immigrant policies including voter suppression and racial profiling laws,” Padilla warned in a written statement that Trump’s choice “sends a deeply troubling message that telegraphs an imminent assault on our collective voting rights and civil rights,” the paper added. Trump’s push to intensify the deportation regimen pursued by President Obama has sent California activists into crisis mode, inspiring an ironic call among some for the undocumented to edge back into the metaphorical shadows to avoid exposing themselves to increased federal scrutiny. One such potential pitfall is the so-called Deferred Action for Childhood Arrivals program, or DACA, designed to help exempt young children from facing penalties older unlawful entrants have often faced. Amid likely tectonic shifts in the policy landscape, California police have not necessarily lined up behind stiffer enforcement measures. Officials in so-called sanctuary cities have warned that a concerted federal push to purge their neighborhoods of undocumented residents would be met with resistance. “Democratic mayors of major U.S. cities that have long had cool relationships with federal immigration officials say they will do all they can to protect residents from deportation, despite President-elect Donald Trump’s vows to withhold potentially millions of dollars in taxpayer money if they do not cooperate,” the Associated Press reported. In fact, Beck and chiefs like him have the law on their side. “Because states and cities can’t be required to enforce federal law — and there’s no U.S. requirement that police ask about a person’s immigration status — it’s likely that any Trump effort to crack down on sanctuary cities would focus on those that refuse to comply with ICE requests,” the AP added, citing Roy Beck, CEO of NumbersUSA.